You can disable the menu bar applet from within MacKeeper's preferences. Screen shot courtesy of Coyote Moon, Inc.
MacKeeper has been around, in various forms, for quite a while. It's marketed as a collection of utilities, apps, and services that can keep your Mac clean, protected from viruses, and in tip-top shape. Unfortunately, many users have discovered that MacKeeper may cause more problems than it fixes. Frequently asked questions about MacKeeper relate to whether it's safe, whether it affects performance, and where it comes from, as it sometimes appears on a Mac seemingly out of nowhere. MacKeeper has a reputation for being difficult to remove; some users have gone as far as reinstalling the Mac operating system in order to get rid of all of the MacKeeper pieces scattered about. Thankfully, you don't need to do that; even the folks at MacKeeper have made the uninstall process a bit easier than it was in the past. If you've decided it's time to uninstall MacKeeper, here are a few tricks that will help you remove it successfully. We're going to start by taking you through the uninstall process for the most current version (3.16.8), though it should work with any 3.16 version. After we've removed the current version, we'll provide tips for uninstalling earlier versions, as well as future ones. If your first instinct is to delete MacKeeper from the /Applications folder by simply dragging it to the trash, you're close; there are just a couple of things to do first. If you've used any of MacKeeper's encryption options to protect any files, be sure to use MacKeeper's Data Encryptor to decrypt all of your files. If you used MacKeeper's backup service, make sure you have any needed copies of the backups on hand. MacKeeper may have placed some of your personal files in a folder within your Documents folder; a common folder name is MacKeeper Backups. Uninstalling MacKeeper shouldn't remove any of these files, but it's a good idea to make sure any important data contained in them are copied to somewhere else. If you're just trying out the demo version of the app, and haven't activated or signed on to any of its services, you can just select Quit from the MacKeeper menu. If you've activated MacKeeper, you need to first quit the menu bar service that MacKeeper runs. Select Preferences from the MacKeeper menu, and then select the General icon. 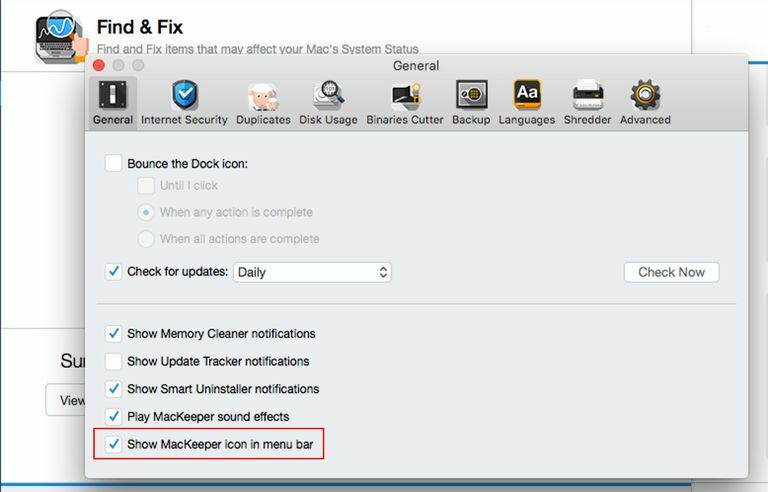 Remove the checkmark from the "Show MacKeeper icon in menu bar" item. You can now quit MacKeeper. Navigate to your /Applications folder and drag the MacKeeper app to the trash. Enter your administrator password when requested by the Finder. MacKeeper may also ask for your password to allow the app to be deleted. Enter your password again. If you were just running the demo version, MacKeeper will be moved to the trash, and the MacKeeper website will open in your browser to display confirmation that the app was uninstalled. If you were using an activated version of MacKeeper, a window will open asking for a reason for uninstalling MacKeeper. You don’t need to provide a reason; instead, you can just click the Uninstall MacKeeper button. MacKeeper will then uninstall all of the services and utilities you activated or installed. You may need to provide your password to allow some of the items to be trashed. The above steps will remove the majority of the MacKeeper components installed on your Mac, although there are a few items you'll need to manually delete. An easy way to get to your Application Support folder is to open a Finder window, or click on the desktop, and then from the Go menu, select Go to Folder. In the sheet that drops down, enter the pathname above, and click Go. You can find out more about accessing your personal Library folder in the guide: Your Mac Is Hiding Your Library Folder. Within the Application Support folder, look for any folder with MacKeeper in the name. You can remove any of these folders you come across by dragging them to the trash. As a final check, pop over to the ~/Library/Caches folder and delete any file or folder you find there with the name MacKeeper in it. You may not find anything called MacKeeper in the caches folder once you uninstall the app, but it seems as if each version of the app leaves a few strays behind, so it’s a good idea to check anyway. With all of the MacKeeper files moved to the trash, you can empty the trash by right-clicking on the trash icon in the Dock and selecting Empty Trash from the popup menu. Once the trash has been emptied, restart your Mac. On its own, MacKeeper shouldn't install any Safari extensions, but if you downloaded the app from a third party, it's somewhat common for MacKeeper to be used as a Trojan for installing various adware services to your favorite browser. If you have adware installed, you've probably already realized it since Safari will keep opening sites and producing popups, all cajoling you to purchase MacKeeper. The easiest way to correct this problem is to remove any Safari extension that may have been installed. Launch Safari while holding down the shift key. This will open Safari to your home page, and not to the website you were previously visiting. In the preferences window, select the Extensions icon. Remove any extensions that you're not familiar with. If you're not sure, you can just remove the checkmark from the extension to keep it from loading. This is the same as turning the extension off. When you're done, quit Safari and launch the app normally. Safari should open without displaying any ads for MacKeeper. If you still see ads, you can try clearing out Safari caches by following this tip: How to Enable Safari's Develop Menu. This will turn on a special menu used by developers for testing Safari website performance, how well extensions work, and general testing of apps used within Safari. From the now visible Develop menu, select Empty Caches. You can also remove any MacKeeper cookies or Criteo cookies (a MacKeeper partner specializing in personalized ads) that may be present. You can find instructions for managing your Safari cookies in the guide: How to Manage Safari Cookies. Earlier versions of MacKeeper were a bit tougher to uninstall, because MacKeeper's uninstaller wasn't very robust and missed a great many files. In addition, its on-site documentation tended to be out of date or incorrect. While we don’t have room to go through all the versions of MacKeeper and show step-by-step instructions for uninstalling the app, we can show you what files to look for and remove. In all versions of MacKeeper, start by quitting the app. In some cases, you may need to use the Mac's ability to force quit an app. Once MacKeeper has quit, you can drag the app to the trash. In the Mac menu bar, click the Spotlight icon. In the Spotlight Search field that opens, enter the first folder listed below. You can copy/paste the folder name (for example, ~/Library/Caches) to the Spotlight search field. Do not press enter or return. Spotlight will find the folder and display its contents in Spotlight's left-hand pane. You can scroll through the list looking for any of the files listed for each folder. If you should come across one or more MacKeeper files, you can press enter or return to have the folder that contains the files open in a Finder window. Once the Finder window opens, you can drag the MacKeeper files or folders to the trash. Repeat the above process for each of the folders listed below. If you find any of the above files, drag them to the trash and then empty the trash. You already checked for launch agents using the file list above. But there could also be startup or login items related to MacKeeper. To check, use the following guide to view current startup items installed: Mac Performance Tips: Remove Login Items You Don't Need. Launch Keychain Access, located at /Applications/Utilities. In the top left corner of the Keychain Access window, check that the lock icon is in the unlocked position. If it's locked, click on the icon and supply your administrator password. Once the lock is open, enter mackeeper in the Search field. Delete any password matches that are found. Your Mac should now be free of all traces of MacKeeper.